A candidate can only download his/her e-aadhaar card only if it has been generated so to Check Status whether it is generated or not , Click here and then scroll down and click on "Check Aadhaar Status" link. After that fill Enrolment Id. and Date Time and the Security Code text shown and click on "Check Status" button. 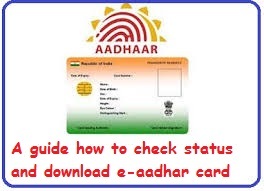 If the Aadhar Card has been generated, To Download E-Aadhar Card Click here and scroll down and click on Download Aadhar Link. After that fill Enrolment No. and Date Time , Resident Name(Full Name) , Pin Code and the Text shown, Mobile Number and click on "Get One Time Password" button. After that you will receive OTP ( One Time Password ) on your mobile no. and then proceed next step in downloading aadhaar card. The aadhaar card will be in the pdf form and to download it , your "Pin Code" will be the password to have e-aadhaar card.